Voiceprint has just reissued this live set from the classic Yes spin off band. For those looking for the history of this release, please check out the review I did of the earlier version of the set. For this review, I am going to focus on the differences between these two sets. The most striking difference to be spotted at first is the packaging. While the original issue of the CD set was presented with sparse packaging in a standard plastic case, this one is enshrined in a nice digipack. The booklet here, although basically just pictures of the members of the group, is an improvement over the first issuance. Medleys that were essentially solo sections of the show by the individual musicians are labeled that way here - and weren't in the original pressing. We also get one more song per CD in the form of "I've Seen All Good People" on disc one and "Starship Trooper" on the second CD. The sound feels to me like it might be a bit improved on this release, too. So, the end result is that while the original set was quite good and well worth having, they've stepped things up a notch or two with this release. Yes fanatics like myself will certainly have to have both. For everyone else, I don't know if I'd rush out to replace my copy with this one. If you don't already have the set, though, what are you waiting for? You should have this vital prog rock live chronicle and this is the one out of the two that you need to get. Since the performances remain the same here - and since I already reviewed the original set, for consistency's sake the track by track reviews will come from that set. This review is available in book format (hardcover and paperback) in Music Street Journal: 2008 Volume 2 at lulu.com/strangesound. This is an orchestral recorded introduction to the show. 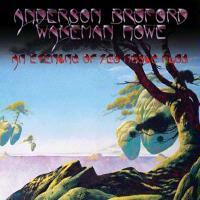 The version of "Time and A Word" here is just Jon Anderson singing over top Steve Howe's guitar picking. It segues straight into an acoustic take on "Owner of A Lonely Heart", again just Anderson and Howe. This, then cuts to the melody of "Owner of a Lonely Heart" with the lyrics of "Time And A Word". They intersperse straight into a Howe/Anderson arrangement of "Teakbois", the reggaeish number from the ABWH studio album, then it moves back to a full (its own lyrics) "Owner of a Lonely Heart" Chorus. They wind it up with a final chorus of "Owner…" with Wakeman joining in with textural keyboards. The next cut finds the maestro, Mr. Steve Howe, performing a medley of solo material from Yes discs. They range from intricate to bouncy and fun. Contrary to the title on the disc there are segments here that are not part of either of these two solos. This is Rick Wakeman's solo segment consisting of various movements from his solo career. It starts off pretty and mellow; then begins building from there. He starts at first on just piano, and shows unbelievable skill at tickling the ivory. Eventually Wakeman brings in the more electronic instruments and picks up the pace and intensity. This is arguably one of the finest keyboard solos ever recorded, capturing a lot of moods and themes. It is truly powerful and inspiring. Beginning on piano, this is the first true ensemble piece on the disc. They play it more true to the studio rendition than on most other live recordings of this Yes classic. Coming off the ABWH disc, a keyboard wash heralds in Steve Howe's haunting and dramatic acoustic guitar intro. Then a lively rhythm section emerges, and Howe solos over top. After this Anderson presents the first verse. The cut switches to electric guitar and more rocking tones as it carries on. It is a poignant and powerful cut that, had it been recorded under the moniker of "Yes" would have found its place alongside the classics. Starting this with the original, seldom performed live, acoustic intro, the band put in one of the more faithful renditions they have ever recorded in concert. It is powerful and beautiful. They lead this off in an acapella fashion. After an iteration of the chorus in this fashion the acoustic guitar enters and we're on our way. A quintessential Yes rocker, they play this one in a manner that's both fiery and faithful to their original rendition. The powerhouse jam late in the track, though, brings in new characteristics and musical patterns, making this one of the cooler versions I've ever heard. Rick Wakeman and Steve Howe both bring new ideas to the table here, while still holding the number true to form. As they trade solo sections we get some extremely vital music. Once again this is one of the more faithful renditions of this awesome epic that is legend in the Yes catalog. With its three movements, this one is a strong one from the ABWH album. It features a fast paced, islands-rhythm inspired main segment and lots of great Rick Wakeman soloing. The central guitar riff and much of the cut is also a strong one, and Howe finds plenty of opportunity to show his fret board prowess. The final movement is based on a killer staccato pattern and includes a musical duel between Howe and Wakeman. The band keep reworking this theme for quite some time, soloing over top of it. The single from the ABWH album, the band put in their live performance of this powerful piece, thankful opting for the album, rather than the single version. This one is dynamic, powerful, and at times, mysterious. Another classic Yes song, this one is driven by the bass. As such, it seems like it might feeling lacking without Chris Squire's presence. Rest assured, Jeff Berlin proves quite capable of handling the duty and the rendition is a strong one that feels much like other versions of the piece. It's a great addition to the set and a strong piece of music. This ABWH track is performed well here, and really shows both a lot of Steve Howe and Rick Wakeman's writing style. Both get quite a few opportunities to solo on it. Bruford manages to find the time for a very unique electronic drum solo in the course of this one, too. The band does the full-length version, again, playing it quite faithfully. Another classic Yes tune performed by this lineup, they open it with a little keyboard excursion that has a bit of Asian flare to it. Once they drop into the familiar segments, it's obvious we're back in the game with another Yes powerhouse. It's delivered in fine fashion and we can all be happy they brought us along for the ride. It's a great way to close things out in style.